A death-obsessed cosmic entity could be one of the main foes Joss Whedon's Avengers will have to face. Joss Whedon's Avengers may have their hands full in the writer/director's upcoming movie if a new rumor rings true. Anonymous sources claim that Thanos the Mad Titan will show up in the film to rain death and destruction down on the universe. The rumor is courtesy of Latino Review, which writes: "According to very trusted always on point sources, Latino Review has exclusively learned that the other villain in The Avengers is... Thanos!" 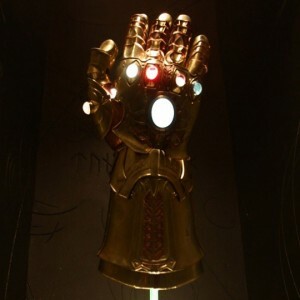 Corroborating this rumor is the unexplained placement of the Infinity Gauntlet (see below) shown off at San Diego Comic Con 2010, in addition to a cameo by the Gauntlet in Odin's Vault in the Thor movie. I'll explain if you're not up on your comic book history. Thanos is a member of the Eternal race, a more powerful offshoot of humanity created by the cosmic Celestials that also lives much longer. Thanos is obsessed with the female embodiment of Death, whom he's met, at one point in time hoping to wipe out every living thing in the universe in tribute. In this effort, he assembled the Infinity Gems onto the Infinity Gauntlet, each gem giving complete power over time, space, reality, mind, power, and soul respectively. Even with this great power, Thanos was defeated and the Infinity Gems were split up so they could be guarded. The Infinity Gauntlet's double appearances hint that the rumor could be true, though it doesn't necessarily mean that Thanos will wield it. Previous rumors said that Loki and the shape-shifting Skrulls would take roles as antagonists in Whedon's film. 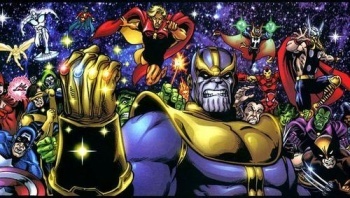 Thanos would be an amazing villain, especially if he's collecting the Infinity Gems, though it would seem to change the scope of the movie from a superhero film to a cosmic space fantasy of sorts, something that Marvel Studios president Kevin Feige recently mentioned upcoming films would cover. The Avengers will be released on May 4, 2012.